Indian Women's Team lived up to the expectation as they outclassed their neighbours Bangladesh by 3-1 scoreline to win the SAFF Women's Championship 2016 title at the Kanchenjunga Stadium, Siliguri on Wednesday, 4th January 2016. The first goal came in the 12th minute for the hosts through Dangmei Grace. The goal acted as a catalyst for the Indian team as they put more bodies forward in search of a further cushion. Bangladesh however responded to the early setback within the first half as Shopna scored in the 40th minute. The second half proved similar to the first half as Bangladesh were pegged back at their own half chasing shadows while Team India dictated the possession with purpose. The inevitable lead came in the 60th minute when Bala was fouled inside the box as the referee pointed to the spot. 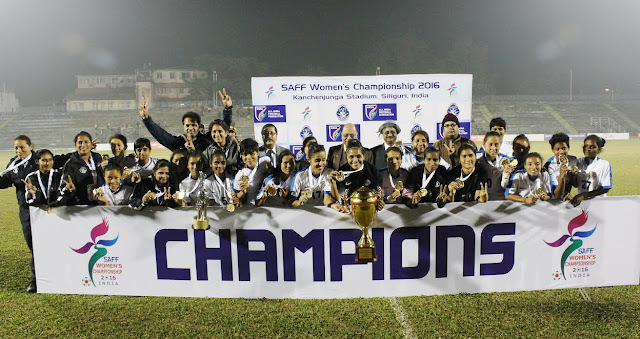 Sasmita Malik, 2016 AIFF Player of the Year converted the penalty with ease. The game was sealed when a lack of concentration from Bangladeshi custodian Sabina allowed a harmless shot from Indumathi to bounce past her into the net. The goal crashed all the hopes of Bangladesh, who earned a place in the finals for the first time. This win stretched India's unbeaten run to 19 matches having won 18 and drawn 1.